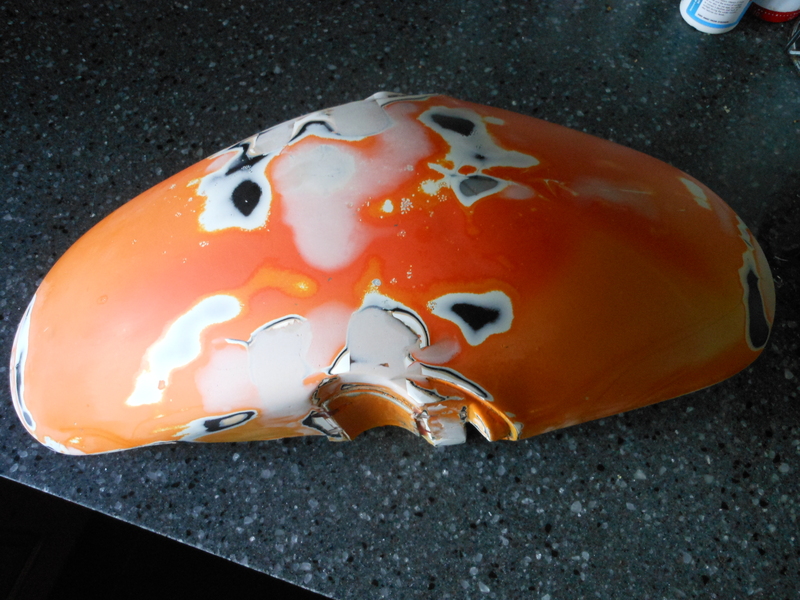 Mac has started on the Harley / Yam project. The forks have been stripped and the primordial ooze emptied from the bottom of the fork legs. The internals look fine so a new set of seals and retaining clips ordered. The legs have gone in the “powder coat box” along with the front wheel (minus bearings that were shot). Need to see one of Heisenburgs mates to sort the Harley / Yam head bearing mix , the stem being almost the same as a Harleys . The bottom yolk was fine but the top had been butchered to accept some “streetfighter” risers – so a set of 1″ dia risers have been acquired with a view to using some old stepped down 1″ – 7/8 bars so that he can use the old switch gear but retain the chunky ‘Harley’ bar look. The top Yolk will need some work (are you reading Mr Heisenburg?). 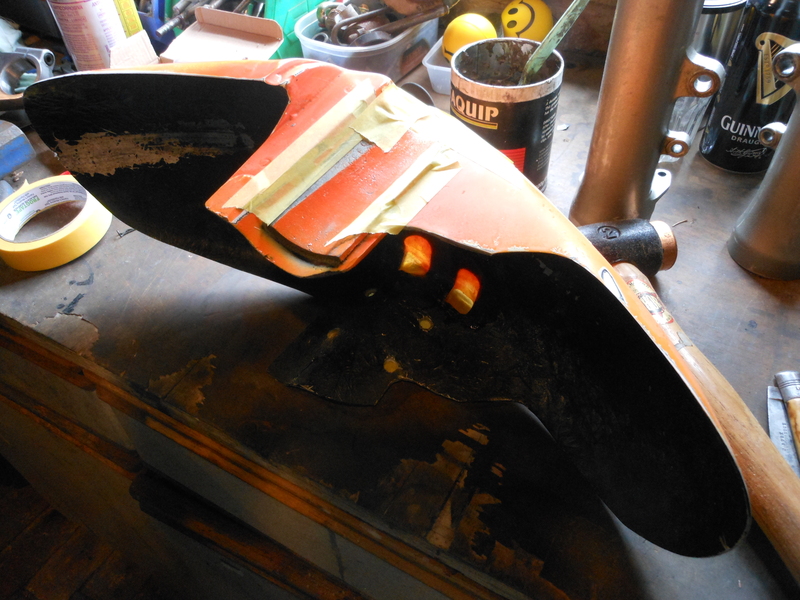 Then there was the front mudguard – looked Ok on the bike but when removed was full of holes – not one to bin stuff it’s been treated to a good scrub down and will be re fibre glassed to accept new retaining bolts. 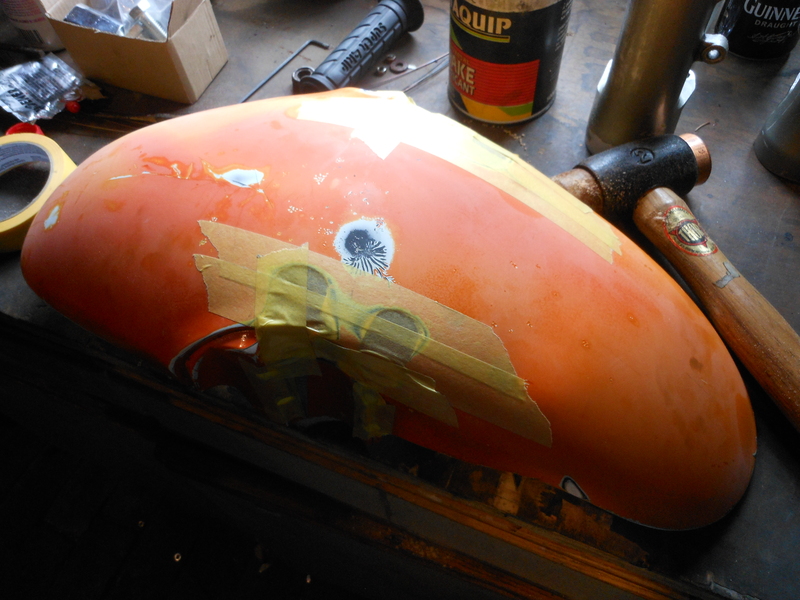 A bit (lot) of fibre glass and bondo and a quick rub down and it’s getting there. Yeah I spotted that, it’s on my ‘to do’ list. Going for a mudguard this time then, I thought you were allergic to’em?